STOP HS2 | Cameron looks for Chinese HS2 deal as the public say ‘Stop HS2’ again. Cameron looks for Chinese HS2 deal as the public say ‘Stop HS2’ again. The day after a Telegraph/ICM showed that 68% of the public think HS2 should be scrapped, or at least paused while alternatives are assessed properly, the Prime Minister is using his visit to China to try and secure Chinese involvement in building HS2. David Cameron shows what he thinks of public opinion. Over the last decade, China has built thousands of miles of high speed railways across its vast interior, but the programme has been beset with safety problems, high-level corruption and financial problems due to the majority of the general public not being able to afford to use trains. In that time, the Chinese have built a vast industry which has no other option but to tout for business internationally. Any Chinese involvement in building HS2 will undermine previous assurances that HS2 construction and development would help growth in the UK. Today, the Liberal leaning CentreForum think tank has criticised, calling it an expensive pet project that “should be canned”, warning that current schemes are “unrealistic and unaffordable”. This follows on from a Telegraph/ICM poll, published on Sunday, which showed that just 3% of the public expect HS2 to be delivered on time and on budget, with only 21% agreeing with Prime Minister David Cameron’s claim that it is “essential” for Britain. 68% of voters want HS2 to be scrapped because it is too expensive, or put “on hold” while alternative plans are drawn up. HS2 is like Building a Waitrose on Rails, Whilst Commuters Queue in Aldi. 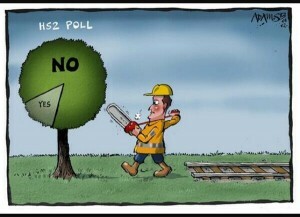 Government refuse to release HS2 polling until after election. You ‘had better’ put up with Cameron’s game and promised profits and join in the battle of the sale-room, selling to the world; energy, transport, State land-grabs and appropriations—-the AONB of Chilterns, the Colne or the scrubs of Wormwood! Give it up to the Corporations of Asia and Foreign Sovereign Funds—-‘gentry’ that were courted bare-footed from the New BRIC. Then we must all agree not to vote as the candidates if they don’t get a certain number of votes lose their deposit.They could be in a mess if nobody gets in. Even if only one person voted across the entire constituency, the candidate who received that vote would be the winner – yes, they’d also lose their deposit (along with all other candidates) but they would still gain election to Westminster. But realistically, the outcome you describe is not going to happen? In fact, I’d go as far as claiming that, under FPTP, all incumbent Conservative MPs who choose to re-stand in May 2015 will be successful, albeit with reduced majorities in some instances. HS2 may be a deal breaker for you but for most voters across Westminster constituencies, it doesn’t really figure as a major issue? Probably your most effective option would be to spoil your ballot paper with a personal message – I’m sure you can think of something pithy? – all spoilt ballot papers are seen individually, either by the candidates or their agents acting on their behalf? Thankyou Peter I am sure I can. Our Dictators need to be informed that we are not happy and it is not just those personally affected,as you seem to think.There are people from all parts of the country that travel to or through the areas affected ,and those that wish their taxes to be spent on more important things. This does seem rather a slight agenda manifesto for asking to be elected for five years, don’t you think? HS2 as a political symptom is actually quite large with its ramifications in terms of planning, national redistribition of wealth (non manifesto’d) gagging of civil rights,the hidden laws on land grab (S47) and the approaches in terms of judicial review that may soon apply to the airports. It affects a large number of lives. This is why it has attracted so much attention. As part of the zeitgeist of politics and society it is significant. History, FOI and failure to deliver the social panacea will unmask the politics over time. Just as it did with concorde. Concorde left a financial and development hole, the scar of HS2 will be massive across the face of the environment and many lives. It is numerically bigger than the poll tax and ‘bedroom tax’ for taxpayers and those who will be affected. It has yet to be manifest*. HS2 was simply the first of the new approaches of central govt imposition of political will over civil democratic wishes. *May be seem slight in terms of a national agenda but it is a living example of where policy underlying HS2 has already has ridden roughshod over many hundreds of thousands of ordinary people whose life work and savings are compromised and lives have been put on hold. The parties have discarded these people as collateral damage in the lawns versus jobs war/traitors to national economy propaganda or frankly simply rubbished them (and the environment) The sham consultations have resulted in a very perverse ‘representation’ if it can even be considered that. Parliament has upheld this charade as democratic. Little wonder people have lost faith. Locally and to the affected areas these issues may represent an agenda that covers a very significant aspect of their lives and their personal politics. No party has offered this concentration of voters a voice. An independent MP in such circumstances would represent working democracy. What is perverse ( and the parties hope for it) is for victims to vote for their abusers and asset strippers out of misplaced loyalty. There are some parties that do not support HS2 but their other agendas may not be acceptable to the centric voter. I do hope the effected communities and those affected by the parallel issues raise some candidates as a mark of ‘people power’ otherwise HS2 sets a dangerous precedent for more draconian abuses and the political use of socially divisive strategies and centrally funded “private” PR campaigns . I seem to remember the Chinese having a major incident with one of their high speed projects……and we’re about to take their money (on which I’m sure they’ll be expecting interest / favors), I really hope we don’t let them get involved with building this white elephant. I just can’t understand why are trying to continue with this mad wasteful stupid project, these politicians are SO out of touch most of them have never had a proper job. There is a real opportunity to launch a political party that is made up of real honest working people from all walks of life that actually care about this country. I’m sick to death of these career politicians who are only interested in themselves, blaming others and taking no responsibility for their own actions.